Not long ago I happened to read that Chopin’s favourite colour was „slate blue“. Just imagine – even the cover alone would have caused Chopin to appreciate our Henle Urtext editions. However, what must certainly have been of much greater importance to Chopin is the true and exact reproduction of his music. It is known, and reliably so, that he himself never twice performed his own pieces identically, and, by improvising, consistently added new vivacity to his compositions. But in matters of print he was very keen on details; this is evident especially from his meticulous autographs, the copies corrected by himself, and his correspondence with his publishers. The reason we, as editors of his music, still have a difficult time with Chopin is that he tended to publish his works simultaneously with different publishers - in France, England Germany – and seldom left us with one definite and authoritative version of a piece to rely on and refer to. Rather, the handwritten clean copies that Chopin forwarded to the individual publishers differed. In addition, the engravers of course would occasionally make mistakes that were not discovered by Chopin or his assistants. 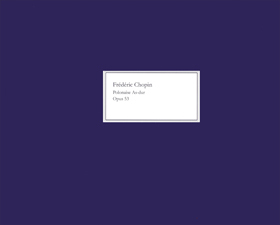 As a result most of Chopin’s works exist in two or three authorized editions that unfortunately are not identical in detail. What to do? In such cases, one must have much experience with the history of Chopin’s works in order to come to the right conclusions and make correct decisions. Should you, dear Readers, wish to gain more insight into the intricacies of such differing print editions I can recommend a visit to the following site: it’s the fantastic offering of » „CFEO“ (Chopin’s First Editions Online), where you are able to leaf through all these early prints to your heart’s content. It is both an obligation and a matter of course for an Urtext publisher to reproduce the works of a composer as accurately as is at all possible. This is a strong demand, and can in Chopin’s case only be achieved with very much effort. But at Henle we willingly accept the responsibility. Several years ago musicologist Dr. Norbert Müllemann joined our editing staff. He wrote a much acknowledged thesis on Chopin’s early autographs. In the course of the years to come he will consistently and diligently review all of the Chopin Urtext editions in the Henle catalogue and, ultimately, we will publish new editions. The » Préludes and » Ballades have already been released. The Grande Polonaise op. 53 is to follow in a new Henle edition. » You can read the first part of our conversation (in German and English) in which we talk about the philological challenges in connection with the Chopin sources. And now, dear Readers it is high time we bring our attention back to the main person this forum is dedicated to, Robert Schumann. Chopin’s own autograph of his Polonaise in E flat major op. 53. This autograph contains all the characteristic features of the mature artist and is a pure delight. The original is in the Pierpont Morgan Library, New York. Of course the printed facsimile is superior in quality and contains a critical commentary. The commentary also reveals why we claim that opus 53 provides a link between Chopin and Schumann: Clara Schumann was once the proud owner of Chopin’s autograph which she highly treasured. It was the first and only Polonaise that she included in her piano repertoire. On 1. April the forum will continue. Possibly Robert Schumann was always a bit overshadowed by Chopin, but we will again, and gladly, focus our attention on him. „By far my favorite is Sequeira Costa's recording (1994); Label: Naxos, Conductor: Stephen Gunzenhauser, Orchestra: Gulbenkian Foundation Symphony Orchestra Lisbon. Sequeira Costa was my teacher for many years (I did study the Schumann Concerto with him), and I have never met any musician quite like him. His concept of sound, his dedication to the spirit of the score, and his philosophy sets him apart. He recently finished the entire cycle of the Beethoven Sonatas, and even though he is 80 years old, he still concertizes on a very high level” (Suzanna K. Perez, USA).